The Montessori Method of education focuses on each child’s individuality and the uniqueness of his or her learning experience. Learning opportunities present themselves in a nurturing environment in which children are encouraged to explore and observe, to learn at their individual pace, to problem solve and develop unique thought processes, as they grow into responsible citizens and discover their world. 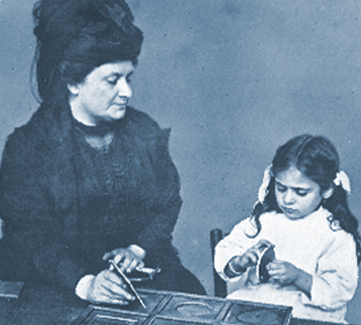 The education of the whole child–academically, emotionally, aesthetically, and socially–is at the center of the Montessori experience. Children are encouraged to enhance their knowledge through self-directed sensory projects as well as teacher-initiated learning in which they interact with others of varying ages as meaningful members of a group. This method of learning builds self confidence, peer cooperation, social responsibility, cultural acceptance, and respect for all people. innovative teaching methods that nurture individual growth. In addition, children benefit from a host of suggested age-appropriate learning materials and environments. These include size-appropriate workstations, manipulatives, and other learning tools. Teachers are given tremendous freedom in curriculum development and are encouraged to develop lesson plans and materials that leverage and develop the strengths of their specific students.